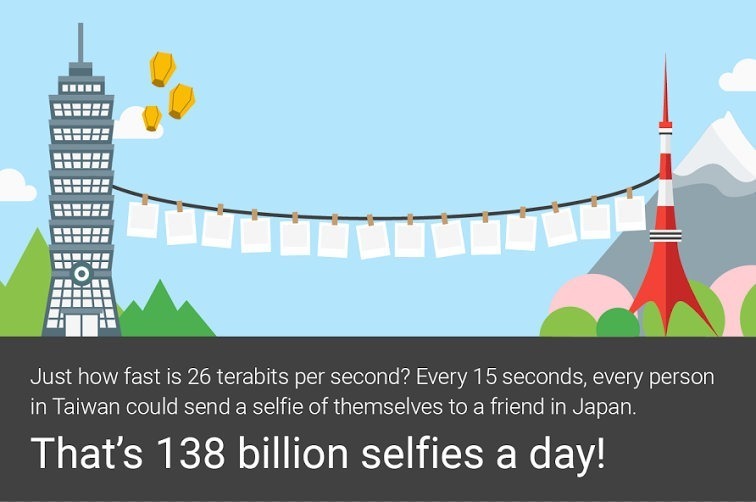 Google’s 26 Tbps Undersea Cable To Asia Will Ensure Lightning Speeds For All Google Services! While internet speeds in India are the lowest in Asia Pacific, Google has some good news for you. A trans-pacific high speed internet cable system was decided to be installed between the United States and Japan in 2014, and the system is finally ready after 2 years of extensive work. The $300 million project, called FASTER, is jointly managed by China Mobile International, China Telecom Global, Global Transit, KDDI, and SingTel, with NEC as the system supplier. What’s even better is that Google has extended this cable to Taiwan, its largest data center in Asia. The FASTER system will offer speeds of upto 26 terabits per second and will serve the whole Asia continent, not just East Asia. This is extremely beneficial for Google users in the Asian subcontinent, that do not enjoy such high speeds. Taiwan has the largest data centre from where the rest of Asia accesses the servers. It is a huge deal for a company to offer such high-speed internet services to a large continent like Asia. Nevertheless, Google says that from today morning, sending emails and loading YouTube videos will get a tad faster. We haven’t noticed any Google services loading faster, but Google assures that these will improve in the coming days. It should also improve the reliability and consistency of this speedier experience, since the cable was strategically built outside of tsunami zones to help prevent network outages related to natural disasters. Since Google runs almost everything you do on the internet, from YouTube to Google Search, from Google Docs to Google Inbox and Google News, you will start seeing noticeable changes in loading times and access times in the coming times. As a whole, not just India, but whole of Asia will be able to use Google products must faster now. The services will also become more reliable, and your internet connection, if slow, will at least access these Google websites much faster. Have you noticed any Google service working faster today? Let us know if you have in the comments section below.